The Republic of Namibia is situated in the west of southern Africa, between Angola, Zambia, Botswana and South Africa, with a total area of 824,292 km². The thirteen administrative regions are Caprivi, Erongo, Hardap, Karas, Okavango, Khomas, Kunene, Ohangwena, Omaheke, Omusati, Oshana, Oshikoto and Otjozondjupa. Besides the capital city Windhoek in the centre of the country, other important cities are the ports of Walvis Bay and Swakopmund, as well as Oshakati, Grootfontein, Tsumeb, Keetmanshoop and Rundu. The Namibian landscape consists primarily of central highlands, of which the highest point is the Konigstein at 2,606 metres. With 2 million inhabitants, Namibia is one of the least densely populated countries in the world (2.5 persons per km²). About half of the population is of the Ovambo tribe and concentrated in the north of the country. Other principal groups are the Damara, Herero, Okavango, Nama, East Caprivian, Bushmen, Rehoboth Baster, Kaokovelder and Tswana. Whites make up about 12% of the population. The official language in Namibia is English. 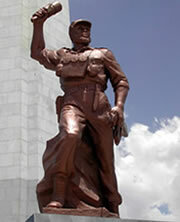 Other main languages are Afrikaans, German, Oshiwambo (Ovambo) and Herero. The national currency is the Namibian Dollar. Exchanging money is possible in banks in all major cities. The Namibian Dollar is pegged with the South African Rand. Mostly Christians of the Lutheran, Roman Catholic, Methodist, Anglican and Dutch Reformed Churches which combined account for 90% of the population. The remainder follow mostly local native tribal beliefs. The main airport is Hosea Kutako International Airport (Windhoek). The flying time is about 11 hours from a European airport to Windhoek. Secondary airports are Eros, Katima Mulilo, Rundu, Ondangwa, Walvis Bay, Lüderitz and Keetmanshoop. There are also over 300 small airfields in all corners of the country. The north has a tropical climate, the south is subtropical. The climate is characterized by hot and dry conditions. Namibia's climate is typical of semi-desert terrain, hot days and cool nights. The temperature in the coastal regions are heavily affected by the cold Benguela current. Summer is from October to April, with average daily temperatures range from 20 to 34º C. Winter is from May to September with wonderful warm days which are contrasted by cold nights. 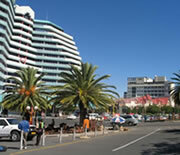 Namibia enjoys an average of 300 sunny days a year. Humidity is generally very low in most parts of the country.